Over the past few weeks, I have been spending just a few minutes every week raking up the leaves as they drop. It's not essential to do it, but if the leaves lie about on the grass, they can create bald patches, and I don't want them clogging the pond when they can get a bit stinky and turn the water brown with their tanins. So I just pop them in a big collecting bucket and then tip them into my leaf bin. Those of you who make your own leaf mould will know what glorious stuff it is. It doesn't smell, and it feels rather lovely - all flaky and crumbly, and wriggling with worms. Some books recommend that you use it as a mulch on flower beds, which is fine. But I think it is too precious for that. 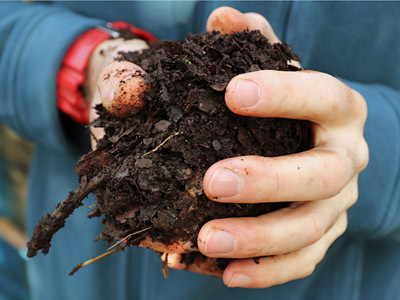 It has such a wonderful consistency, and isn't stuffed with nutrients, which makes it perfect when sieved to mix with peat free compost and a bit of sharp sand to make a better-balanced seed and potting compost. What a natural way to sow some seeds of wildlife-friendly plants. 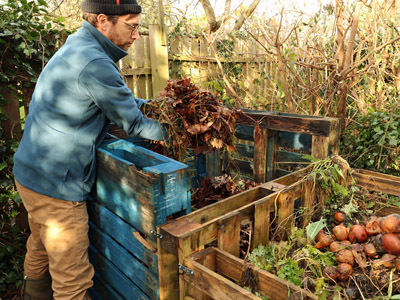 And of course the beauty of making leaf mould is that, once you've tipped those leaves into the bin (or into a large porous builder's sack, or even into a large black binbag spiked with a few holes), that's it. That ball of leaf mould I'm clutching in the photo? I hadn't done a single thing to it since last year; it had made itself. Magic!